Hampton Inn and Suites Robbinsville features an indoor pool and an outdoor seating area with table tennis in Robbinsville, New Jersey. Free WiFi access is included. Providing a tranquil environment, the rooms at Hampton Inn and Suites Robbinsville each feature a private bathroom and a flat-screen TV with satellite channels. At the Robbinsville Hampton Inn and Suites, guests are provided 24-hour front desk assistance. The property has an on-site mini market and and a business centre. Free parking is possible on site. The Hampton Inn and Suites Robbinsville is 12 minutes' drive from Six Flags Great Adventure. You must show a valid photo ID and credit card upon check-in. Please note that all special requests cannot be guaranteed and are subject to availability upon check-in. Additional charges may apply. Please note, a fee of up to USD 250 will be assessed to those who smoke in a non-smoking room. Please contact the front desk for information on the locations of designated outdoor smoking areas. Guests are required to show a photo identification and credit card upon check-in. Please note that all Special Requests are subject to availability and additional charges may apply. 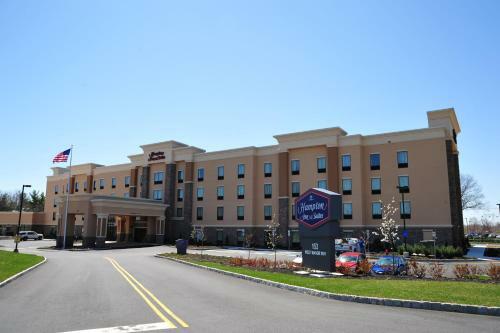 the hotel Hampton Inn and Suites Robbinsville so we can give you detailed rates for the rooms in the desired period.